Elon alumni have exclusive access to a range of benefits and resources offered by the university. 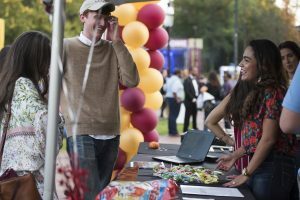 Each resource is designed to enhance the alumni experience and provide opportunities to further connect with Elon’s alumni network. To receive all the benefits listed below, alumni are encouraged to update their information. As Elon Alumni, you have access to resources and tools to help build your network, plan and promote your career, and be a lifelong learner. Regional Chapter Events | Find your chapter here! Access to the Elon Network LinkedIn that connects over 9,000 alumni. Don’t know how to network? Check out this Networking Guide! Elon’s Student Professional Development Center offers alumni many of the resources utilized by current students. The experienced staff can offer career coaching, resume crafting, interview practice and job search resources. To schedule an appointment call (336) 278-6538. Elon’s digital library can be accessed here. Access to the Elon Job Network where jobs and professional development videos are posted. Professional development webinars are hosted periodically throughout the year by the Alumni Engagement Office. Here you can access all past webinars. A podcast devoted to alumni career and professional development. Through the Beyond the Oaks podcast you can develop skills and ideas to strengthen your professional profile. Be sure to subscribe on your preferred podcast listening application (Apple Podcasts, Google Music, or Spotify) to make sure you don’t miss out on any episodes! New episodes will be released periodically throughout the year and will feature a different Elon alum telling their story of the successes and challenges they have faced since graduating. 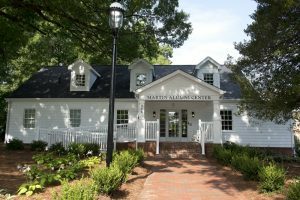 Located in the historic “Rich” house on the corner of Haggard and North O’Kelly avenues, the Martin Alumni Center is Elon’s campus home for alumni. It houses the Office of Alumni Engagement and has been recently renovated to include the office of President Emeritus Leo M. Lambert. As the campus hub of alumni hospitality, visitors can schedule tours and inquire about alumni programs, events and volunteer opportunities. Monday through Friday, 8 a.m. to 5 p.m. The MAC is closed on holidays recognized by the university. Visitors can park in the McMichael parking lot, including the recently expanded lot to the north side of the McMichael building. Contact the Office of Alumni Engagement toll-free at (877) 784-3566 or via email at alumni@elon.edu. The Magazine of Elon keeps alumni informed with the latest news on university programs and facilities, class notes and engaging stories on alumni and professors. The Alumni Action section offers information on regional and campus events, as well as important updates on alumni programs and services. Alumni also receive This Week @Elon, the university’s weekly e-newsletter via email.